There is something very satisfying and hugely restorative about decluttering and organising, but you get to a new level of gratification with organised drawers! I’ve been a tidying, clutter-clearing champion for a long time but it was only after reading Marie Kondo’s book a few years ago ‘The Life Changing Magic of Tidying’ that I realised, although my families things are well organised, I wasn't storing clothing correctly. In fact I was doing it completely wrong. Folding flat or tiredly shoving clothes into drawers at the end of a busy day resulted in frequently reorganising to make closets and drawers neat again. 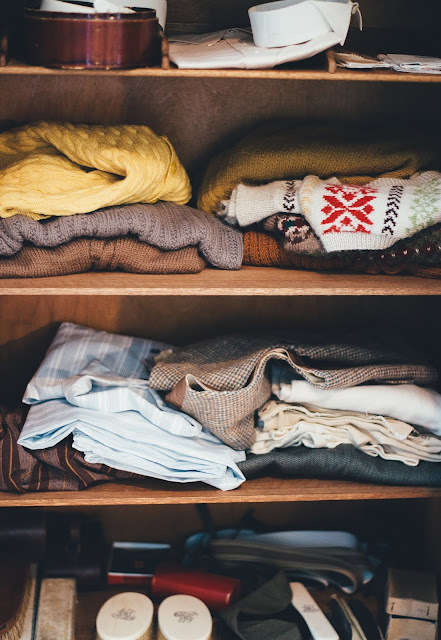 All our clothing had been decluttered and paired back to items that only sparked joy, but a bad system of storing resulted in drawers being in the exact same cluttered state a few weeks later, albeit with less clothes. By following a simple storage technique for clothing, suggested in the book, I haven't needed to reorganise drawers and wardrobes since! Also, the correct storage of clothes actually expands the space so I can fit more in and see every item at a glance. I’ve been vertically folding my families clothes for a few years now and to say it’s been life-changing is an understatement. Babies and toddlers grow at such a rapid pace, when I think back to the time before I stored clothes this way, and the amount of beautiful outfits that were rolled in a ball at the back of a drawer - that they had outgrown and missed out on wearing - I feel what a waste! Everything else is folded in drawers. I’ve turned empty spaces in wardrobes into drawers, and shelves in wardrobes into ‘drawers’ by folding clothes neatly in boxes before putting them on a shelf in the closet. 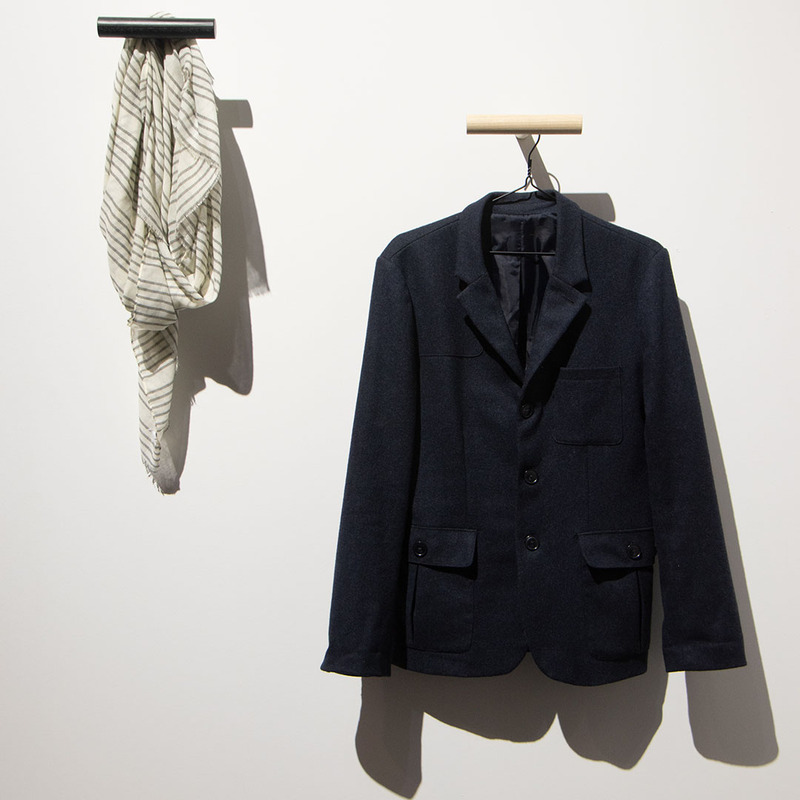 Using wardrobe space in this way frees up more space for storing folded items, and with only a few garments now hung on rails less space is actually needed for hanging. The aim is to fold each piece of clothing into a simple smooth rectangle. First fold the lengthwise side of the garment towards to centre and tuck in the sleeves to make a rectangular shape. Next pick up one end of the rectangle and fold it towards the other end leaving a gap of about an inch before it meets the top. Then fold again in halves or in thirds. 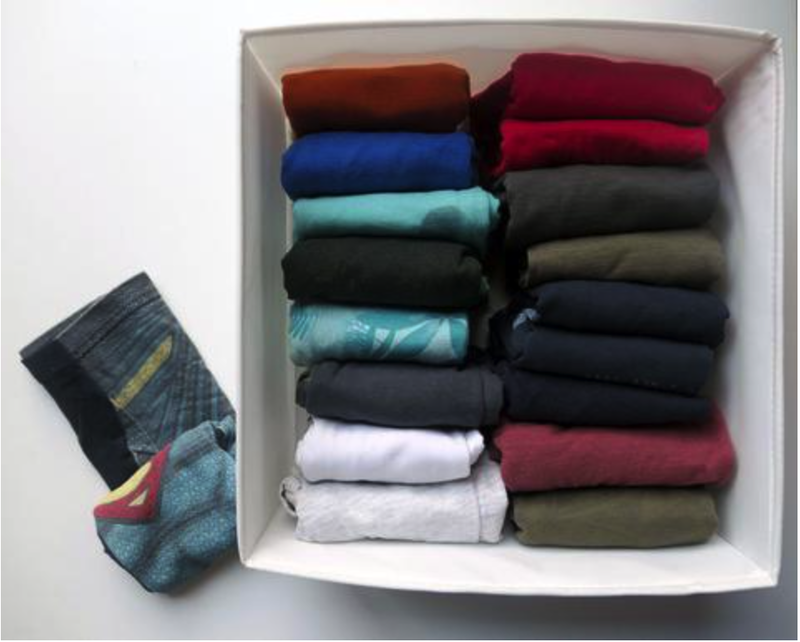 The number of folds should be adjusted so that the folded clothing when standing on edge fits the height of the drawer. And that’s it, a perfectly folded garment that you will be able to stand upright! Yes, it definitely takes a little longer to fold clothes correctly so they’re stored upright and easy to see as soon as you open a drawer. But the benefits far out-weight the time spent putting clothes away. It's time-consuming at first, but once you organise everything this way, you’ll find that you actually save time. It’s a good idea if your finding it cumbersome to pair it with an enjoyable task. I always sort clothes in the evening time, and always in the bedroom, the large area on a double bed is the best place for me to sort and fold. While I’m folding I pop on a podcast or light some candles and listen to music. It’s become the most enjoyable household chore and now something I look forward to doing! This, for me, has been the most transformative aspect of the ‘Konmari’ method - the technique of gathering all of your belongings by category, only keeping those that spark joy and choosing a place for everything. Clothing is one of the categories seen and used every single day. Keeping them organised gets us closer to the inner calm and clear mind we strive for.